The International Casino Exhibition kicked off in London today and on-line poker dominated the agenda for many travelling business people. Net Entertainment, Boss Media, Chartwell Technology as well as video gaming giants Sega were amongst the dozens of companies here in London for ICE. Amazingly and, perhaps most notably, absent were Cryptologic. With impressive appearances from Crypto in recent years, many were questioning why the software provider to the likes of William Hill, didn't turn up this time. Despite the lack of any Crytologic stands, there was still plenty taking place. Magnus Falk, from Boss Media, Swedish software provider to the likes of Poker Heaven, was keen to show off the recently introduced Omaha and Omaha Hi/Lo poker games on their network. The growth of Boss Media has been staggering, with a reported 30,000 global players per 24hr period, dwarfing last years reported numbers. Mike Marandino, Director of Sales for Chartwell Technology, was also demonstrating a new piece of poker software. 32 Card Poker looks a wild and highly entertaining form of the card game, which is sure to attract the on-line casino gamblers in their droves. Playtech, the provider of advanced graphic softwares, had a very interesting live dealer game streamed in from Manila, in an apparent demand from the growing Asian market. 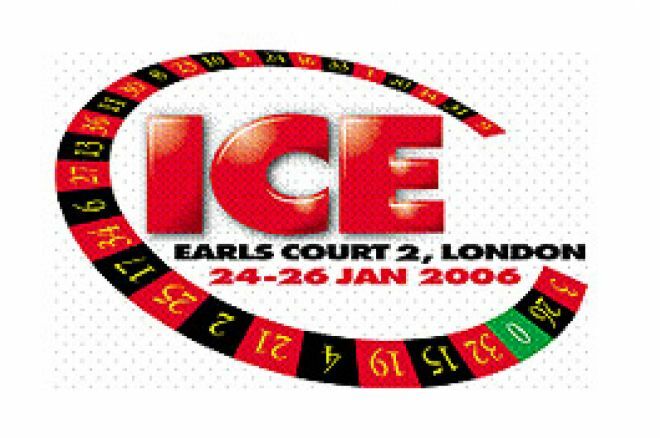 With so much going on at ICE, on-line gaming business people should not hesitate in attending this years show. With hundreds of exhibitors from dozens of countries there may not be enough time to see everything on offer. Ed note: Cool poker players are very welcome at Coral Poker with a generous $600 bonus on offer for new players, you'd be crazy not try it out. Online Poker Regulation On The Way?